Is your Arduino running low on GPIO? Looking to control the brightness of 16 LEDs individually? Maybe blink or breathe a few autonomously? Want to delegate scanning an 8x8 matrix of 64 buttons to another controller? These are all tasks the for which the SX1509 16-IO Expander was made! The SX1509 is a 16-channel GPIO expander with an I2C interface -- that means with just two wires, your microcontroller can interface with 16 fully configurable digital input/output pins. But, the SX1509 can do so much more than just simple digital pin control. It can produce PWM signals, so you can dim LEDs. It can be set to blink or even breathe pins at varying rates. And, with a built-in keypad engine, it can interface with up to 64 buttons set up in an 8x8 matrix. An SX1509 controlling three LEDs, monitoring three buttons and a 12-button keypad, and producing SPI signals to drive a Serial 7-Segment Display. It's a really cool chip and a great tool for expanding the capability of your Arduino or any other I2C-capable microcontroller. This tutorial will serve to familiarize you with all things SX1509 and the SparkFun Breakout. Then we'll demonstrate how take advantage of all of the I/O expander's features using an Arduino-compatible microcontroller and our SX1509 Arduino Library. 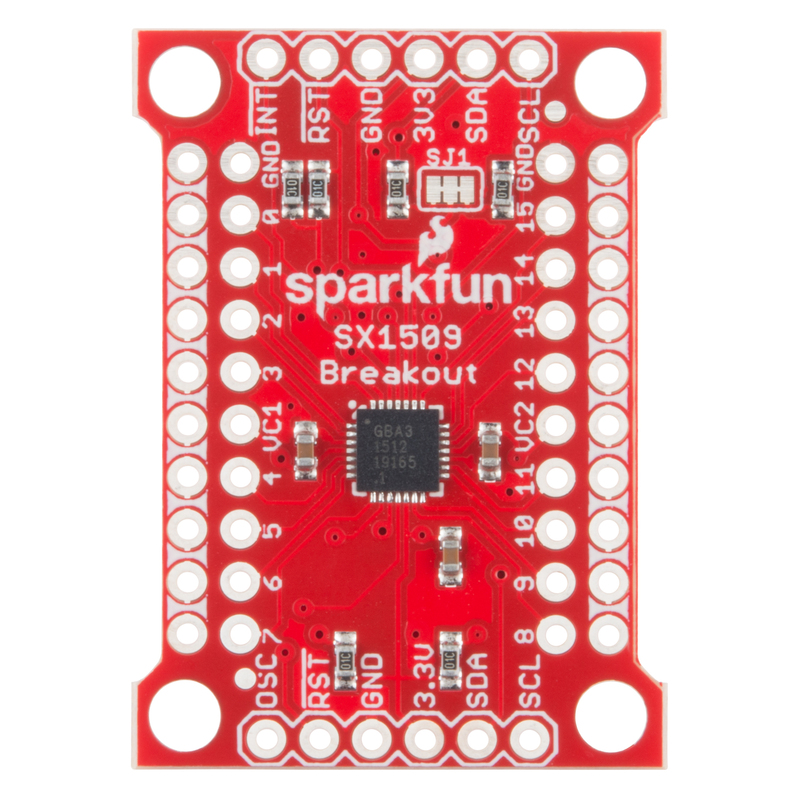 SX1509 Breakout Board Overview -- An overview of the features of the SX1509 and the SparkFun breakout. 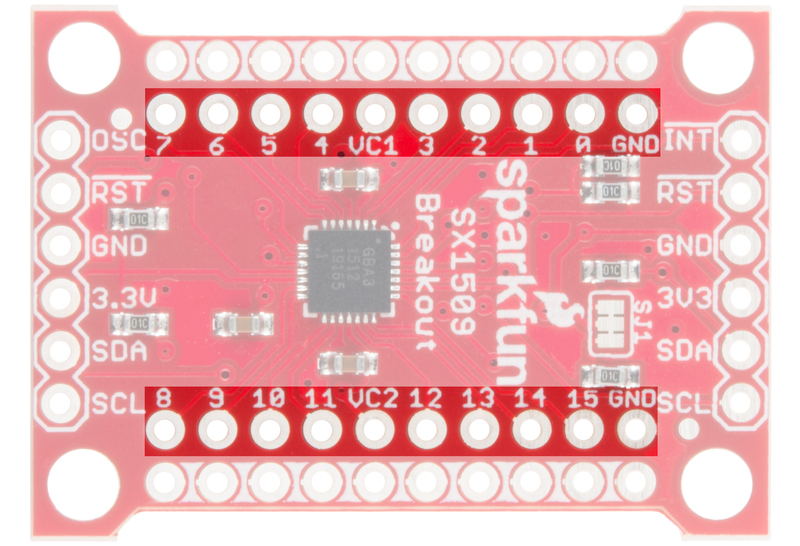 Hardware Assembly -- Tips and tricks for soldering headers or wires to the SX1509 Breakout. Installing the SparkFun SX1509 Arduino Library -- We've written an Arduino library to abstract all of the ugly register bit-operations. Example: Digital In/Out and PWM -- An example circuit and Arduino sketch demonstrating some of the simpler I/O expander features. 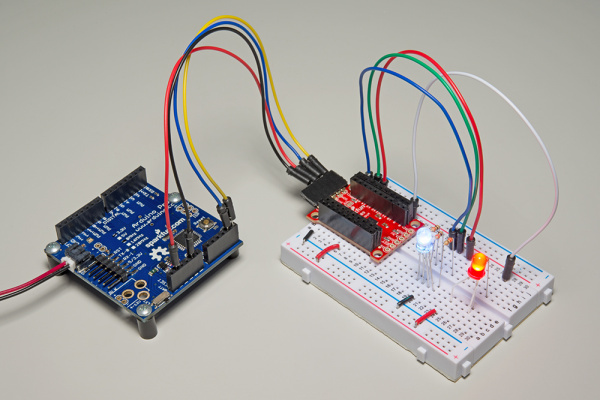 Example: LED Driving -- Examples demonstrating how to autonomously blink and breathe LEDs. Example: Button Matrices -- How to use the SX1509's keypad engine to monitor a 12-button keypad. I2C Communication -- The SX1509 is controlled over an I2C interface. Learn all about this powerful 2-wire interface. Logic Levels -- While most Arduino's operate at 5V, the SX1509 works at 3.3V. The GPIO are, at least, 5V tolerant! Pulse-Width Modulation (PWM) -- All of the SX1509's output pins are capable of producing a PWM signal. That means you can control the brightness of LEDs! There's a lot going on on the SX1509 Breakout. GPIO and power buses are broken out in every-which direction, and configurable jumpers cover most of the rest of the board. 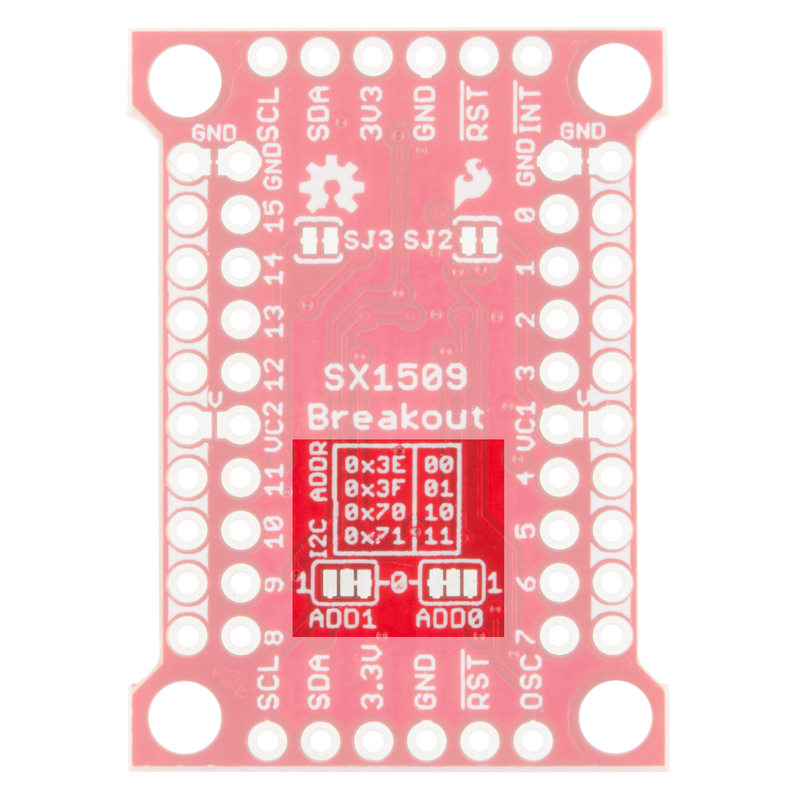 This section will cover all things SX1509 Breakout, so you can get the most out of the board's features. These two headers at the top and bottom of the breakout board are the input and control headers to the board. This is where you can supply power to the SX1509, and where your I2C signals -- SDA and SCL -- will terminate. The SDA and SCL pins each have 10kΩ resistors pulling them up to 3.3V. These resistors can be disconnected by cutting the SJ1 jumpers. RST -- the SX1509's active-low reset input -- works just like an Arduino reset pin. If the pin is pulled LOW, the SX1509 will power down. When RST rises, the SX1509 will turn back on, but all of its settings will be cleared out. The breakout board includes a 10kΩ resistor pulling RST HIGH, so you ignore this pin if you don't need the reset functionality. INT is a very handy interrupt output, especially if you're using any SX1509 pins as inputs. It can be configured to go LOW whenever a pin state changes. The breakout board includes a 10kΩ resistor pulling INT HIGH. Finally, OSC breaks out the SX1509's OSCIO pin -- the oscillator input/output. This highly-configurable pin can be used as either the clock input for the SX1509 (if you don't want to use its internal 2MHz clock), a clock output (producing an up to 2MHz square wave signal), or a simple digital I/O. Required and optional pins: The pairs of power and I2C pins are the only ones required for interfacing with the SX1509. RST, INT, and OSC are all optional, they can be left disconnected if you don't need the feature they provide. The real meat of the breakout board are the pairs of rows breaking out all sixteen I/O pins plus the power rails. The SX1509 breaks its 16 I/O into two banks -- bank A and bank B. Each bank can operate on a separate power supply, but by default they're both set to 3.3V. Bank A is powered by VCC1, and bank B is supplied by VCC2. VCC1 and VCC2 can range between 1.2V and 3.6V, if you want to supply them externally. Check out the "Jumpers" section for more information on that. Every I/O pin is capable of PWM and blink outputs, but only half of them can be set to "breathe" (blink with smooth transitions from on to off). Also, if you plan on using the SX1509 keypad driver, each I/O is relegated to either a row or column interface. Running alongside the I/O breakouts are a pair of power rails. These rails can be distinguished by the bars of white silkscreen running between each pad. By default, these rails are both set to ground -- handy if you want to fan out some active-low buttons, or current-sourced LEDs. Jumpers on the back side allow you to switch the rails from GND to either VCC1 or VCC2. You'll need to cut the jumper between GND and the rail, then blob solder between the rail and VCC. This bus is completely optional. Just don't solder male pins into both rows of headers if you plan on using the breakout in a breadboard! Up to four SX1509's can be connected to a single I2C bus, by configuring them to different addresses. The SX1509 has two pins devoted to I2C address selection: ADD0 and ADD1. Each of those pins are broken out to a jumper on the bottom of the board. The board defaults each of those pins to GND, which sets the I2C address to 0x3E. To set either jumper to "1" (HIGH), grab a hobby knife, cut the trace connecting to "0", and blob some solder between the center pad and "1". SJ1 and SJ2 on the back-side of the board connect VCC2 and VCC1, respectively, to the 3V3 voltage supply input. So, if you're delivering 3.3V to the board, each of the I/O banks will operate at 3.3V. If you want to take advantage of the SX1509's level-shifting capabilities by powering these banks at something other than VCC, cut the jumpers and plug any voltage between 1.2V and 3.6V into the VCC1 and/or VCC2 pins. These supply buses are completely independent -- so they can operate at different voltages. 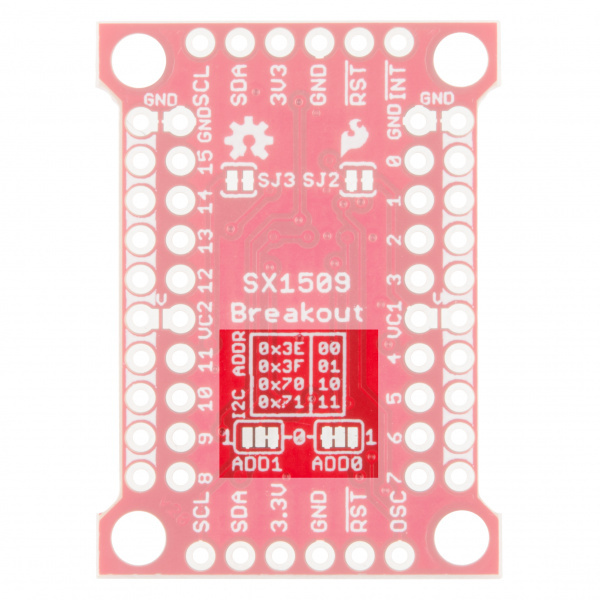 You'll need to solder something into the SX1509 Breakout to use it, whether that something is male or female headers or wire is completely up to you and your intended application. If you've never soldered before, check out our PTH soldering tutorial. One option we like, which keeps the board as breadboard-compatible as can be, is soldering male headers on the I/O banks, and female headers on either (or both) of the power/I2C headers. Then you can use male-to-male jumper wires to connect between your microcontroller and the breakout, and breadboard the rest of the I/O. Now that you've got the hardware all mostly figured out, it's time to start programming! To help make using the SX1509 as painless as possible, we've written an Arduino library to help interface with it. 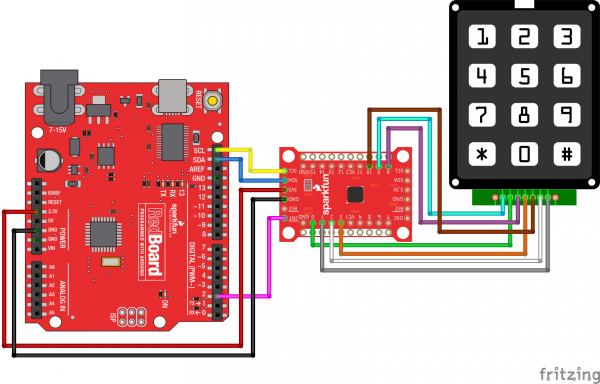 Visit the SparkFun SX1509 Arduino Library GitHub repository, or click the button below to download the latest version of the library. 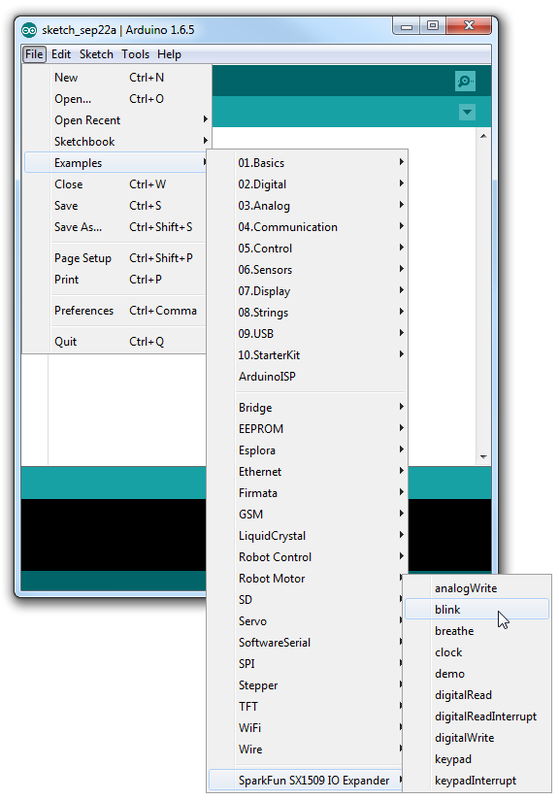 Download the SX1509 Arduino Library! For help installing the library, check out our Installing an Arduino Library tutorial. 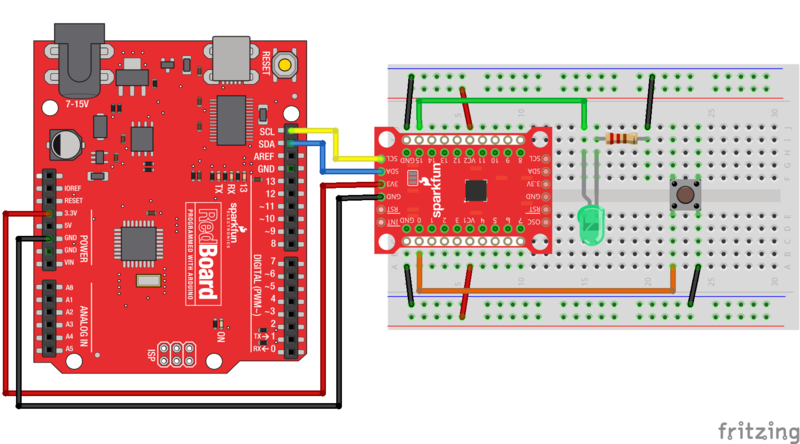 If you downloaded the library as a ZIP, you can use Arduino's Sketch > Include Library > Add .ZIP Library tool to automatically add it to your Arduino sketchbook. The SparkFun SX1509 Arduino library includes all sorts of examples, which demonstrate specific features of the I/O expander. 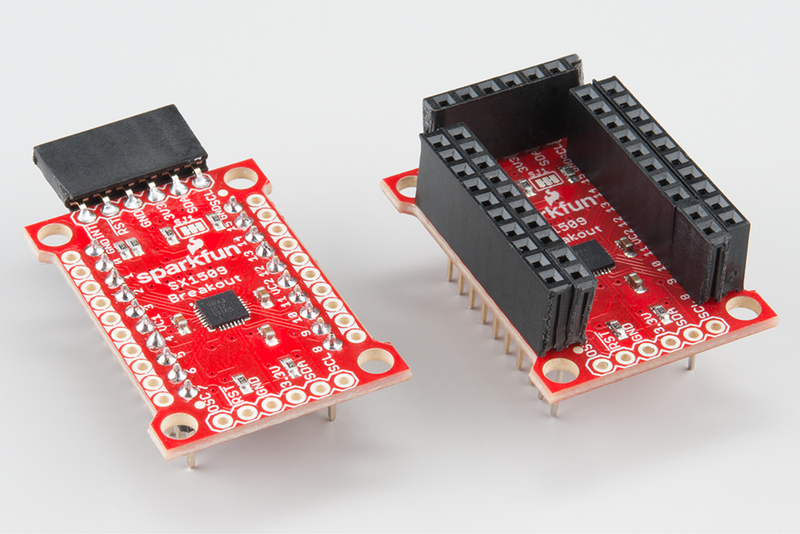 Navigate to File > Examples > SparkFun SX1509 IO Expander to check them out. Quickly, we'll walk you through a few quick examples that show off the I/O expander's range of features. As with almost any I/O expander, each of the SX1509's GPIO can be configured as simple digital inputs or outputs. So you can toggle LEDs on or off, monitor for button presses, or even bit-bang more advanced digital interfaces like SPI (probably nothing that's timing-dependent though). Match up 3.3V, GND, SDA, and SCL between your Arduino and the SX1509 Breakout. Then connect an LED to I/O 15 -- you can either configure it to source or sink current. And connect an active-low button to I/O 0. // expander. It'll return 1 on success, 0 on fail. ; // And loop forever. // either LOW or HIGH. When you press the button down, the LED state should toggle. Check through the code to see how easy it is! Not all that different from Arduino code you may already be familiar with. You'll use that io object from here on out. To initialize the I/O expander -- and to make sure it's communicating correctly -- call io.begin(<address>), where <address> is the I2C address of the expander (0x3E by default). Check the return value of begin() to make sure everything is hunky-dory. Then you can use functions you should already be mostly familiar with to control the I/O. Just tag the io object onto the beginning of pinMode, digitalWrite and digitalRead, and go about your Arduino-business as normal! ANALOG_OUTPUT: If you want a pin to produce PWM signals, call pinMode(<pin>, ANALOG_OUTPUT) in your setup. That will tell the SX1509 to initialize the pin as an "LED driver". Sinking Current: analogWrite(<pin>, <0-255>) assumes that the LED is hooked up in a current-sinking fashion -- meaning the LED's cathode (negative pin) is terminated into the SX1509. Thus, analogWriteing to 255 will actually pull the pin LOW, and 0 will set it HIGH. // pwm or other LED driver functions. delay(500); // Delay half-second at the top. delay(500); // Delay half-second at the bottom. That's a real fine breathing LED! But the SX1509 is so much more than a simple digital I/O expander. Its LED-driving capabilities mean you can offload all of that breathing to the SX1509, leaving your loop() for more important tasks! One of the SX1509's coolest features is its built-in LED-driving support. 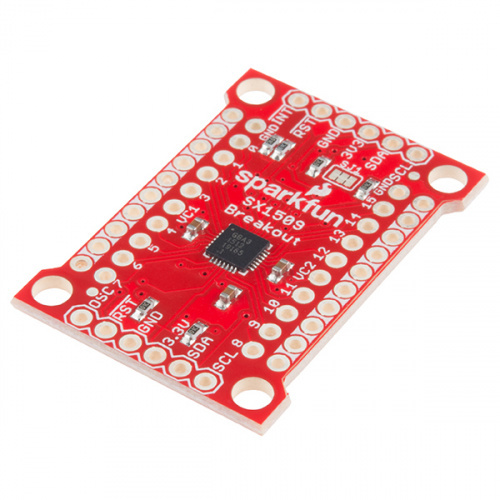 Beyond digital or even PWM output, the SX1509 can also autonomously blink or breathe LEDs! Just tell it how long to blink, or how fast to rise/fall, and it'll do the rest for you. For this example, grab four LEDs and wire them up to pins 8, 13, 14, and 15. Source vs. Sink: The SX1509 can either source or sink current, but it has a much higher capacity for sinking current. It can source up to 8mA per I/O, or sink up to 15mA. If you're driving LEDs, we recommend hooking them up to sink current. // clock to generate a slower LED clock. // The divider parameter can be anywhere between 1-7. // get more accurate timing. The io.blink(<pin>, <low_ms>, <high_ms>) function works most of the magic in this example -- setting the LED pin to blink LOW for 1000ms and HIGH for 500ms. Those timing values will not end up being exact. The SX1509's timing mechanism is dependent on dividing the clock (we're using the internal 2MHz oscillator), and doesn't always divide down perfectly. Before configuring the pin to blink, we call io.clock(<source>, <divider>) to set the clock that drives our LEDs. In this example we use the SX1509's internal 2MHz clock as the source, and divide that down to 250kHz for the LED clock. Play with that second parameter to see just how much the blink timing depends on it. Try using the blink function to blink the other LEDs! Half of the SX1509's I/O pins are capable of producing "breathing" outputs -- where a pin fades in and out at a set rate. Pins 4-7 and 12-15 have this capability. // Use the internal 2MHz oscillator. Make sure you set the pin as an ANALOG_OUTPUT using the pinMode() function. Then call io.breathe(<pin>, <low_ms>, <high_ms>, <rise_ms>, <fall_ms) to set the LOW and HIGH time as well as the number of milliseconds it takes to rise from LOW to HIGH and fall from HIGH to LOW. Blinking and breathing LEDs can be fun, but the SX1509's real power lies in its keypad engine. By wiring up buttons in a row/column matrix, you can connect up to 64 buttons to the SX1509. 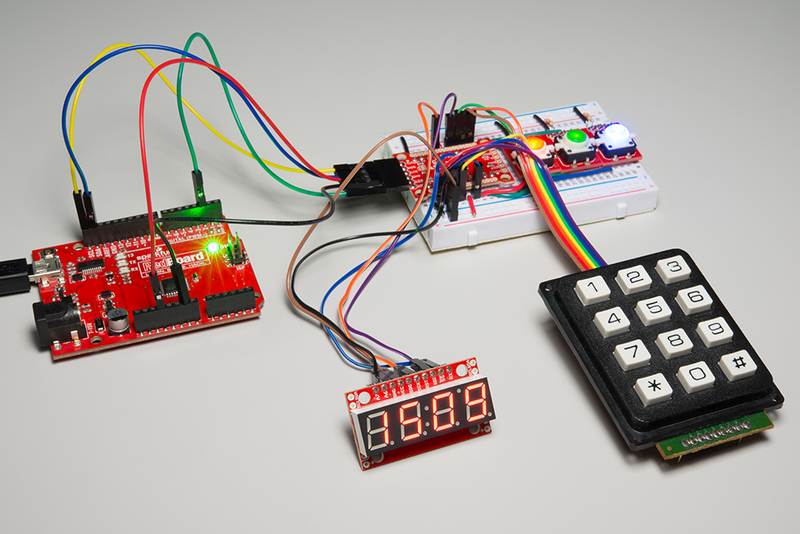 Keypad matrices are very common -- they allow you to save immensely on GPIO. You could monitor a 16-button, 4x4 keypad pad with 8 I/O, or four of those keypads (a 64-button/8x8 matrix) with just 16 I/O. There isn't a lot of flexibility in the SX1509's keypad engine. The rows of you matrix have to be connected, sequentially, to pins 0-7, and the columns wire up to pins 8-15. Our four row buses must route to pins 0-3, and the three columns are connected to 8-10. That still leaves plenty of pins for LED driving! // to tell it how many rows and columns are in the matrix. // which row and column keyData says are active. 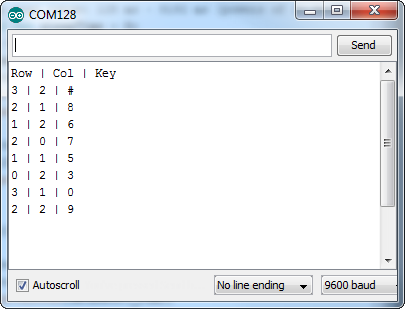 After uploading the code, open the serial monitor and press some keys! Now just hook up a cellular shield and go make some prank calls! Keep in mind any of these SX1509 features can be combined, as long as you don't run out of I/O (then just cascade another expander!). Check out the library's examples for demonstrations of other features -- like the clock output, or input debouncing. SX1509 Datasheet -- This datasheet has everything you'll need if you want to mess around with the SX1509's register data, or build the SX1509 into a PCB design of your own. 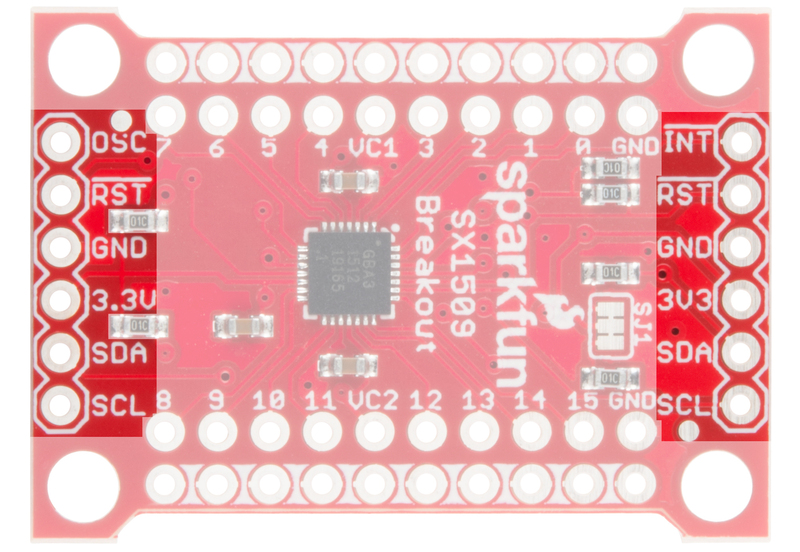 SX1509 Breakout GitHub Repository -- Here's where we host all of the design files for the SX1509 Breakout. 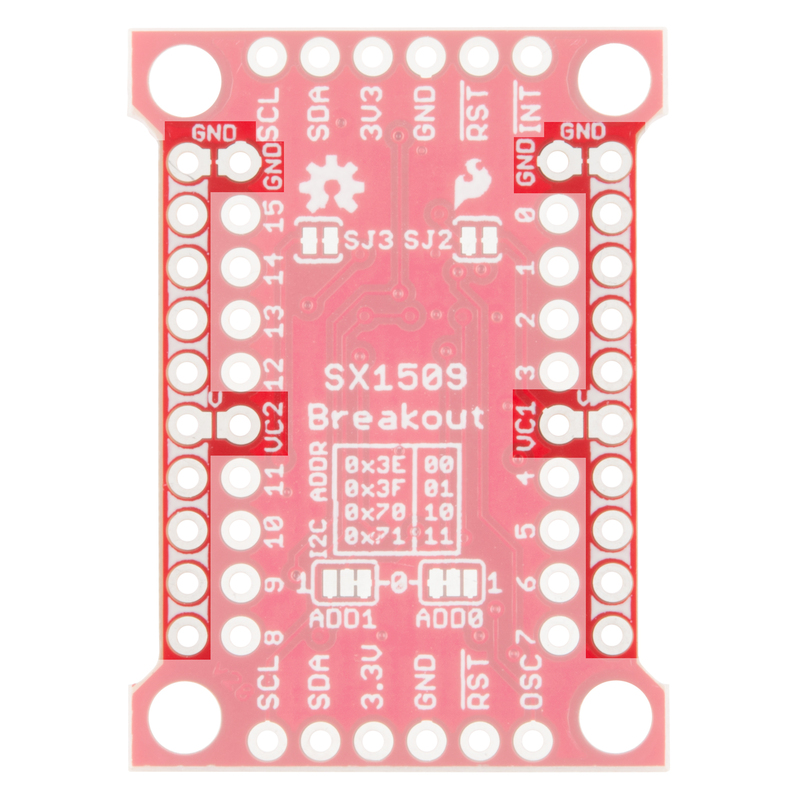 SX1509 Breakout Schematic -- A PDF of the breakout board's schematic. SX1509 Arduino Library GitHub Repository -- This is where you'll find the latest version of the SX1509 Arduino library. Using the Serial 7-Segment Display -- You can bit-bang an SPI interface using the SX1509, and use it to drive this 7-Segment LED. Or! Use the SX1509 to drive a basic 7-Segment display. Using the Arduino Pro Mini 3.3V -- The Arduino Pro Mini pairs very well with the SX1059! Bubble Display Hookup Guide -- These awesome little bubble displays are ripe for interfacing with the SX1509.